THE FOLKLORICO DRESS is made out of blockprinted Cotton Indian Bedspreads, (cheapest of all cottons if you calculate the per yard cost.) Imagine the bedspread dress with a contrasting, solid yoke often edged with contrasting bias fabric in a solid, beaded or even embroidered. The bodice and sleeve edges receive this decorative treatment. The finished garment will bring 100$ to 200$ in America, England or France however the elements to make it are inexpensive, bought in India. The design is Afghani where they use very solid strong cottons and heavy embroidery on the yoke. Their dresses unfortunately smush down the bustline and are uncomfortable for bustier western women. are one color scheme. With the HINDU bedspreads you'll find a lot of Rousseauesque natural sea foam greens and blues. THE FOLKLORICO DRESS can be fitted, narrow, long or short. It can be done in subdued neutrals, dark colors, suitable for business or be gaudy and florid for parties. The bedspread dress hand washes well, is air dried partially, then starched and ironed by hand so it's fresh. The only lining appears in the yoke and a pre-shrunk cotton should be used. The dress breathes. It has no polyester. It is exotic and welcomes necklaces and bracelets. 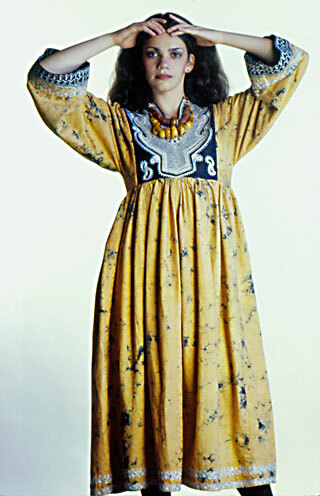 As I could only find a few folk art dresses online, this one is to demonstrate bodice treatment in contrasting print. I prefer the decorative bands, insets be of plain cotton. 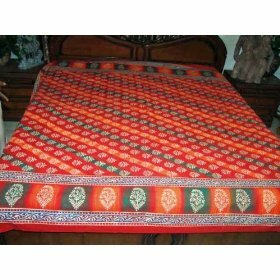 The block printed bedspread which is wildly printed is used for the greater portions of the garment. Myself, I don't like reds, blacks or browns but some clients will and these are the only colors I could find on the internet to make my points. FINDING PATTERNS THAT WORK WITH BLOCK PRINT. You have to update most ethnic patterns from online shop "FOLKLORE" Snazz up the 'typical ethnic' dresses by WESTERNIZING them with a low neckline, (SEE BELOW) which modern city girls want. Note that this bathing suit neckline is widely squared off, a real body/shoulder enhancer. Imagine it with a two piece bodice that hugs and lifts the bustline by letting the shoulders carry the yoke, ergo carry the bust. The dress can be empire below, (i.e. full skirted,) but only once it comes in tightly under the breasts. Make some with no sleeves for hot weather but the ethnic dress has sleeves. Imagine this as a dress yoke, with a SKIRT! The puffy sleeve on the photo below is an option but I think most women would think it too 'period' like the muttonchop sleeves of the 1800's. You can see a narrow bodice, making top of body narrow, and the full sleeves and gathered, empire skirt but imagine it with the LOW, SQUARE neckline above. WOW! THE ETHNIC DRESS appeals to all women. It looks handmade, like you got it from a MUSEUM. It's artsy craftsy and its owners even want to sequin and bead the bodice a little extra, themselves. Encourage that. Show them what they can do with some braid. Give your business a saucy name. "CURRIED COTTONS" or "FOLKLORICO FROCKS" Colors named "TABASCO RED," "LAPIS BLUE". Google "ethnic patterns' + folklore patterns, afghani wedding dress, and while you're at it, TORY BURCH designs, she used to do great ethnic embroidered frocks for hundreds each. Oprah adores her.